Hellebores - The Winter Wonders in the Well Designed Garden. 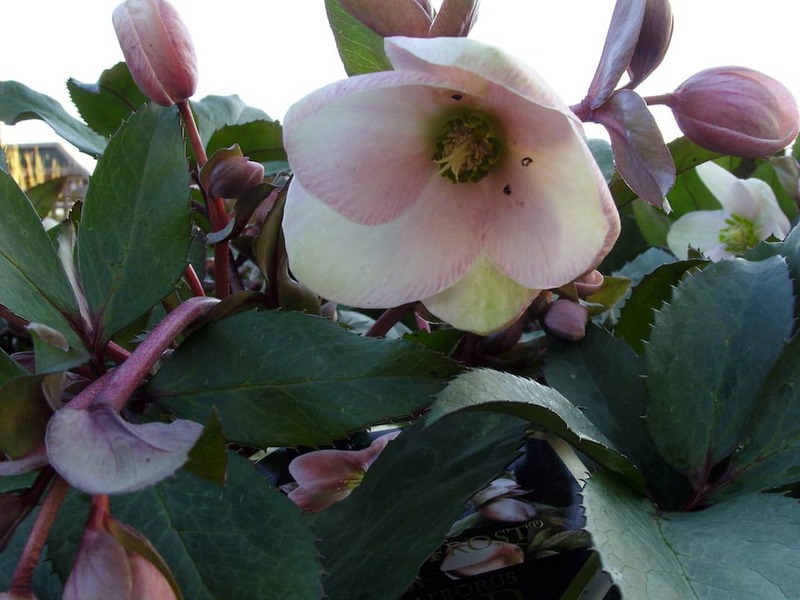 Home » News » Latest News » Hellebores – The Winter Wonders in the Well Designed Garden. Hellebores – The Winter Wonders in the Well Designed Garden. In the dark days of January & February when the cold drives us indoors you might think that there isn’t much of interest going on in the garden. But you would be wrong. The winter garden can have a lot to offer if planned right, especially with the help of a garden designer. And it’s now that the first signs of the new gardening season start to emerge and catch the eye. One of the stars of this time of year has to be the Hellebores in all their different guises, in flower and foliage they have a lot going for them and with a careful selection you can have flower colour from mid winter through to early spring. Hellebores are an undemanding lot and will cope with north facing situations and cold soils. Even gardens that are shady will have plenty of scope for many of the different species and varieties. If your soil retains moisture many Hellebores will cope with some sun as well and although they need a little care and attention at the time of planting they are not too fussy. As they spend a long time undisturbed in the same place in the garden, good soil preparation with compost and fertiliser in each planting hole pays in the long run. Some of the earliest Hellebores to flower are Helleborus niger, the traditional ‘Christmas rose’, although they don’t always flower this early. Plants of the Blackthorn Group for instance have variable white flowers that age to a pleasing dusky pink as the season progresses. 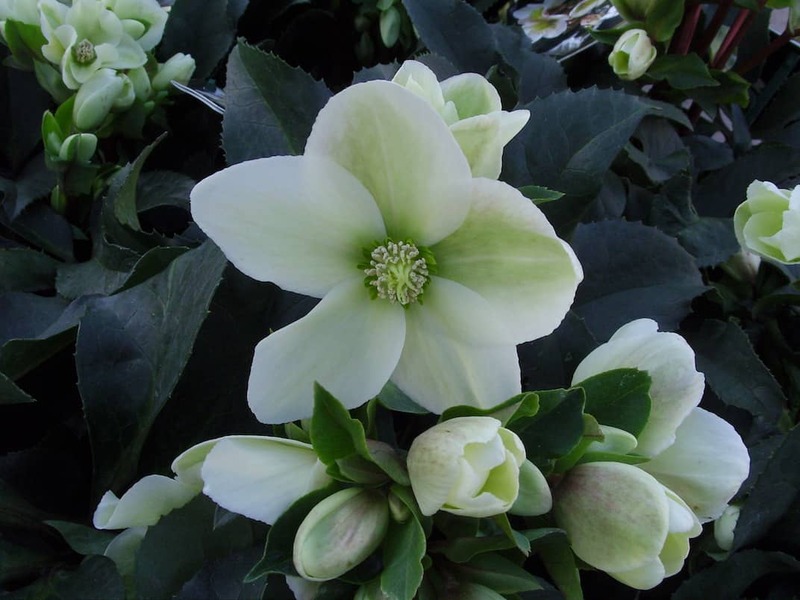 Helleborus x ericsmithii is a favourite of garden designers, with attractive healthy evergreen foliage which can have an interesting pewter colouring to the leaves. Its flowers open up to a subtle creamy white with dusty pink shading. These flowers will just keep on going endlessly through to spring gradually getting darker in colour and never failing to cheer you up whenever you see them. 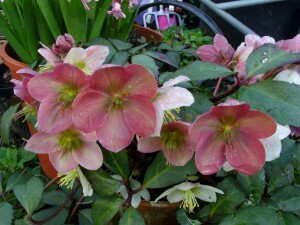 They need a little more sun than other Hellebores but look very good in containers as do Helleborus x sternii. 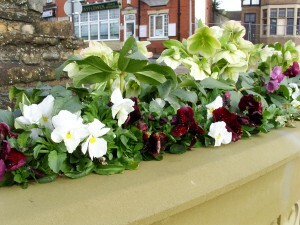 These are superbly reliable with both flower and foliage and combine well with early flowering bulbs. For a much wider selection of flower colours look to the large Helleborus hybridus group, often know as the oriental hybrids these tough plants have flowers that range from white through to primrose through to pinks, light and dark, crimsons, plums to very near black. Some have an array of reddish pink spotting on the inside of the petals that complements the main flower colour. They have been a favourite of nurseries for breeding for a long time so there are a lot of different strains to look for. Make the most of these Hellebores now & take advantage of a 10% discount offer if you click on and print off the voucher from this website and take it to Podington Garden Centre near Wellingborough, Northants 01933 353656. They are offering Hellebore ‘Pink Frost’ & Hellebore ‘Champion’ at a special discount rate to readers of this article. Just hand in the voucher in at the till as you pay to receive your discount……….